Rooftops are an immensely underutilized resource for optimizing building performance. 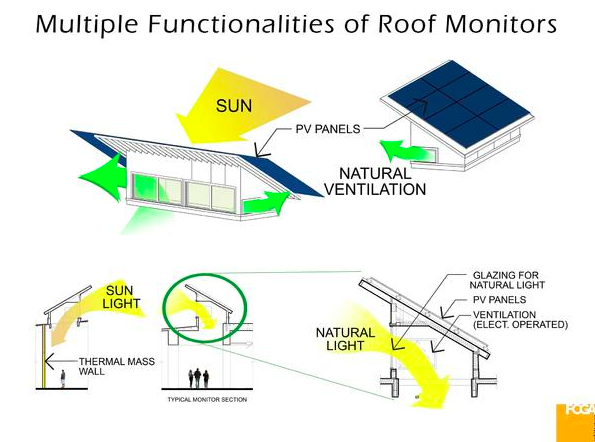 Rooftop strategies can include painting the roof white or installing a solar reflective “cool roof” to reduce summer cooling loads; covering the roof with vegetation to improve insulation, reduce storm-water runoff and provide community spaces; and mounting solar photovoltaic or solar hot-water panels to reduce utility bills. Adding daylighting and ventilation through skylights and roof monitors is a strategy with growing popularity and potential. Common sense might lead us to believe that penetrating the roof with skylights and monitors could compromise a building’s insulation and thermal performance. However, with the availability of advanced products, such as glazing, suspended film and high-performance sealants, well-designed and constructed rooftop penetrations can successfully lower energy costs and improve occupant comfort and health. Rooftop prescriptions vary for every individual project, and a variety of factors must be considered before proceeding with construction. For example, rooftop penetrations will primarily only affect the floor directly beneath the rooftop, so single-story buildings or multistory buildings with a central atrium are ideal. When further determining which types of projects would benefit from roof penetrations, the design team must perform thorough climatic analysis, examine the existing infrastructure and occupancy conditions, and weigh all variables through cost balancing. Before diving deep into analysis, it’s important to understand different types of rooftop penetrations in this capacity and how their design and operational synergies can enhance the value and performance of a building. Traditional skylights, tubular skylights and roof monitors are the main types of rooftop daylighting/ventilation penetrations and should be considered individually because of their varying benefits. Traditional skylights offer natural daylight, which can improve the health and productivity of building occupants. Tubular skylights capture sunlight from a small, clear dome on the roof; pass the light through a highly reflective tube; and diffuse the light through a lens into the building. Because of their high efficacy and smaller penetration area, tubular skylights have better thermal performance and are more suitable for harsher climates than traditional skylights. Roof monitors are vertical fenestrations built into raised structures atop the roof. If the monitors are operational, they contribute exponential building-performance enhancements beyond the other penetration types, including stack-effect ventilation. The figure above depicts the many functions of roof monitors: natural daylighting, ventilation, passive heating and cooling, glare reduction and structural support for rooftop solar-power systems. As with skylights, roof monitors help disperse natural daylight more evenly and completely throughout a room than windows on the side of a building. When paired with thermal mass, such as concrete or water, vertical glazing on the roof helps capture heat from the sun to offset the building’s heating load. Glare presents a big problem for worker productivity in buildings; careful design of roof monitors and ceiling systems can help distribute the light and reduce contrast glare. Finally, monitors can be topped with angled roofing that matches the optimal sun exposure angle for solar panels mounted atop.